In case you’ve been living in a black hole, this year is all about space. The 50th anniversary of the moon landing takes place on July 20, 2019. And Houston — AKA Space City — is reaching for the stars to celebrate. The city is offering special space themed hotel packages, cocktails, food, events and activities in Houston throughout July. So take that small step to Houston and join a giant celebration for mankind. While Houston’s Freedom over Texas happens every year, this year is extra special to celebrate the 50th anniversary of the moon landing. Houston’s official July 4th celebration takes place in Eleanor Tinsley Park at Buffalo Bayou and features live entertainment, food booths, and a world-famous fireworks display. The Houston Symphony continues its annual celebration with the Star-Spangled Salute at Hermann Park’s Miller Outdoor Theatre. Festivities include fireworks accompanied by a dramatic 16-acannon salute. Special for 2019, NASA is getting involved in the Freedom Over Texas celebration. From 4-10pm, NASA will bring its Destination Station exhibit and do outreach on air, on stage, and on the grounds during the event. We can’t promise any astronaut sightings, but you never know who may touch down on July 4th! Experience an all-day and evening celebration of the 50th anniversary of Apollo 11 landing on the Moon and the first steps on the Moon. Attend special panel presentations featuring Apollo-era flight controllers. Meet renowned authors, including “Dutch” von Ehrenfried (signing his book “Apollo Mission Control: The Making of a National Historic Landmark”) and Rick Houston (signing his book “Go Flight! The Unsung Heroes of Mission Control”). Soak up live music under the stars during an evening concert. Participate in a public countdown led from the stage to Neil Armstrong’s first steps on the Moon at 9:56 p.m. CST (much like the ball drop on New Year’s Eve in New York’s Times Square). Attendees will receive synchronized digital lighted wristbands for Mission Control-worthy precision. 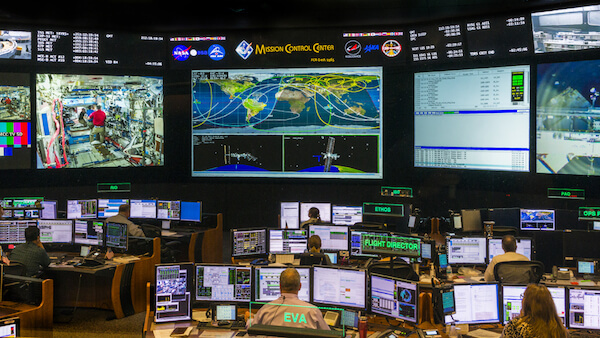 Take a late-night NASA Tour Tram to Rocket Park & Historic Mission Control. Explore a Family STEM Zone with fun and educational activities. Take advantage of a VIP package, including pre-party/happy hour and special seating at concert, including a commemorative chair to take home, or dinner and a special presentation by Apollo era luminaries, as well as an evening tour of Historic Operations Mission Control. 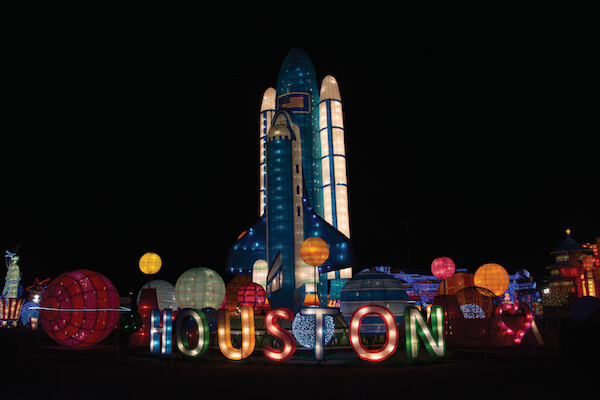 This iconic Houston outdoor attraction will come alive on July 20th with a big moon landing celebration that includes a screening of Apollo 13 as part of the annual Julydoscope free outdoor summer concerts. NASA will also run their Destination Station exhibit before the film. Additional details on special events to come. A number of Houston hotels have put together special space-themed hotel packages to commemorate this iconic moment in time ranging from astronomically expensive to stellar steals. Below are our top three picks for all budgets. The Post Oak Hotel is offering an out-of-this-world hotel package that comes with an astronomical price tag ($10,000) worthy of an elite Space City experience. The package includes a two-night stay in a luxury king room, $300 food and beverage credit, the Spa’s Ritual of the Five Worlds signature treatment for two, a special welcome amenity, and helicopter transportation from The Post Oak Hotel to Ellington Field. Upon landing at Ellington Field (located 15 minutes away from Space Center Houston) a vehicle provided by Space Center Houston will pick-up and transfer the guests to the facilities where they will meet their tour guide at the Group Reservations Office. Marriott Marquis Houston is known for its Texas-shaped lazy river, but throughout July their “Mission to the Moon” Package will transform the property out of downtown and into space. The hotel will transport guests to their room in elevators with floor-to-ceiling images of astronauts in space and greeted to astronomy artwork in each of the guest rooms. The hotel is also offering a special moon landing package to include a “Moon Melt Massage” and “Over the Moon” cocktail. Starting at $454/night, guests will receive a Moon Melt Massage and $50 hotel credit to dine at any of the hotel’s restaurants and indulge in a signature “Over the Moon” cocktail. Hyatt Regency Space City is starting at just $169/night. Instagrammable astronomical moments will be found at this hotel June-August with picture perfect space cocktails and snacks; a special space-themed room, complete with two complimentary Space Center Houston tickets; and a rocket photo booth in the lobby. From incredible food in unexpected locations — including gas stations! – to the explosion of food halls and 12 James Beard nominations, Houston’s culinary scene is anything but ordinary. Given the high concentration of immigrants, Houston is an international culinary destination with no shortage of interesting food fusions. To toast to the moon landing anniversary, below is a small sampling of space-themed flavors. Inspired by and visually depicted to model one of the oldest and brightest galaxies in the universe: Cosmos Redshift 7. This multi-layered drink is made with lemon vodka, elderflower liqueur, lemon juice, honey syrup, butterfly pea flower and ice that changes the top layer of the drink from blue to purple as it reacts with the acidity of the lemon juice, lemon wheel and approved edible, kosher and vegan glitter. This cocktail is inspired by the famous words left on the moon by the Apollo 11 astronauts. This cocktail is created by award-winning Sommelier/Mixologist Sean Beck and is made with Sipsmith Gin, El Tesoro Tequila, Maraschino Liqueur, Green Chartreuse, lime, and a Crème de Violet “Moon” ice cube. Riel is celebrating the 50th anniversary of the moon landing with an out-of-this-world menu. From Launch Day (July 16) through Splash Down Day (July 25), Riel chef/owner Ryan Lachaine will offer special menu items inspired by what the Apollo 11 astronauts ate during their space flight, including hot dogs and porchetta with an apple sauce base. The restaurant also will offer specialty themed cocktails during that time period, including “Dark Side of the Moon” featuring Madeira, creme de cacao, scotch, bitters and 8th Wonder Rocket Fuel beer. Kenny & Ziggy’s, a local Houston favorite, will be serving up three out-of-this-world dishes in the month of July (aka “Space City Month) in celebration of the 50th anniversary of the moon landing. The Teahouse room inside Yauatcha will be serving its signature Egg Custard Mooncake under its starry ceiling. The Mooncake contains a Cantonese-style custard baked in golden pastry. Award-winning Pastry Chef Ruben Ortega has created the Roca Lunar (“Moon Rock in Spanish) to serve up during Space City Month featuring a chocolate mousse “moon rock,” chocolate soil and caramel-coffee foam.